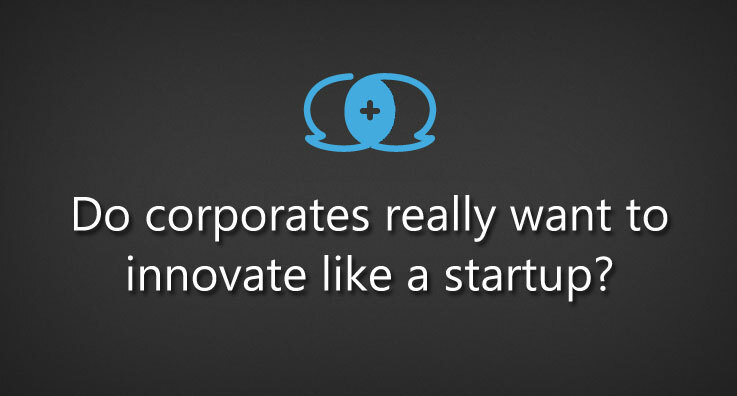 Do corporates really want to innovate like a startup? Say no to unknowns. They want the attention and loyalty that startups garner from their users, but they don’t want to deal with the roller coaster that is a startup: dealing with unknowns. And it is all very simple, through it is a constant cliche, because the possibility of failure is very high in startups; that is what corporates don’t want any part of. Much like people have a tendency to avoid loss at any cost, this deep rooted human bias is heavily entrenched in a corporate culture. Requires different skills and mindset. Corporates need to not just to learn the methods of startups; but also their mindset. This means that different skills and mindset are required to be able to deal with unknowns, which in the startup world means minimizing risk through speed. The simple fact that a couple of dudes can come up with a business concept, test and launch it in a few days is almost unheard of in most corporate environments. The “1 / 1” factor. They don’t teach you how to be unique in business school because most business schools are not unique. Corporates are afraid of uniqueness. Instead, they’d rather buy uniqueness than develop it on their own. Customer vs. Profit focused. Startups focus on the customer because most start out eliminating all the hassles corporates created. Corporates, in an effort to maximize their profit from every single customers, aim to lock in customers by creating complexity that makes it hard for customers to leave. We could on and on about this topic, but a mindset shift needs to occur for corporates to start acting more like startups. One that puts speed, uncomfortableness, uniqueness and purpose ahead of profit. The more interesting question is: do corporates have to innovate like startups? What impedes employees from being innovative in the workplace? Tagged corporate entrepreurship, corporate innovation, entrepreneurship, Innovation, startup.